As you leave Hania behind you and head for Rethimno, the first thirty-two kilometres of your journey, up to the intersection leading to Vrisses, are on a beautiful wide road - here called the National Road - that will invite you to speed. If you go too fast, though, you will miss the chance to see many interesting sights along your way. 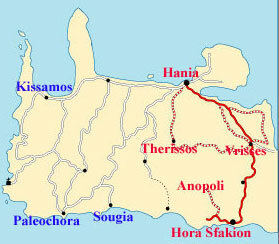 The National Road stretches for two hundred kilometres along the coast of Crete. It connects Hania and Agios Nikolaos and it is practically the only highway on the island allowing you to ride at full speed. Many foreign bikers, after spending an exhausting few days on the winding country roads of the island and tiring of the appalling low speeds, take this road from end to end just to get it out of their systems. The people of Hania know the road like the back of their hand. From time to time they stage Dragster races on it, proving that they are indeed very fast drivers. Their fellow cyclists from Rethimno, Iraklio and Sitia also enjoy driving here, and the latter often entertain themselves by making all other vehicles look... motionless in comparison to their superbikes. If you and your motorcycle want to let off steam because of the dreadfully slow rides in the Hania countryside, you might feel the irresistible urge to imitate them and drive as fast as possible until the road will allow you to go no further. Do not hesitate to satisfy your desire. Pop down to Rethimno or Iraklio and return to Hania feeling relieved. And now you can calmly start Route number 4! About twelve kilometres east of Hania, you will reach an intersection with a road leading to the south (Gr/E sign to Megala Chorafia and Aptera). Turn right on this road (A3) and follow it up the mountain, then turn left at Megala Chorafia. 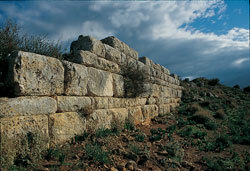 You will shortly arrive at the Aptera archaeological site, situated just east of Metochi. If you want to enjoy the best view of the Souda Bay (to the north) and the valley of Kiliari with its many olive groves (to the south), continue on the road which leads to the northeastern part of the hill and stops just outside the Itzentin Fort. Turkish rule would last a long time, decided to reinforce the defence of Hania where the administration was based. He made up his mind to build the fort in 1867 and gave it the name of his son, Itzentin. It is one of the best preserved Turkish forts, not only because it is the most recently built, but also because it served as a Greek prison until 1971. Although on the outside the architecture has remained intact, the inside has been changed radically and often reinforced with cement in order to serve as a prison. Today it stands abandoned and unguarded, and it is full of rubbish nobody seems to care about. Once you have explored the area leave ancient Aptera behind you, return to Megala Chorafia, and turn south (toward Stilos). 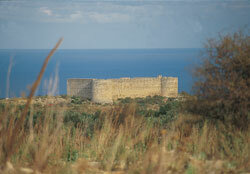 You will cross a rural area full of olive trees and streams which join to form the Kiliari river. Settlements have existed in this fertile land since the Minoan period. In fact, one such settlement was recently brought to light when a hill was excavated in the area near Stilos, just after the crossroads leading to Malaxa. You will certainly find that the road you have taken - the old National Road which connects Hania and Rethimno - does not have much traffic, since everybody seems to prefer the new road. After a quiet ride, you will arrive at Vrisses. From Vrisses you can go just about any place (including Sphakia), as you will soon discover. The village has some Rooms to Let and a small hotel, and on the main street there are lots of coffee shops, restaurants and super markets, so this is a good chance to replenish your supplies. In the super markets you will also find fresh fruit, refrigerated and delicious. Once you stand on the spot where ancient Aptera was situated, you will understand that the reason the Dorian settlers chose this location to build their town was the magnificent view! Built at a height of two hundred metres above the sea on a steep hill, with the entire Souda Bay at its feet, this important west Cretan town looks like it has taken off; why on earth they chose to call it Aptera (“the non-winged one”) remains a mystery! The prevailing interpretation derives from Greek mythology: a musical contest between the Muses and the Sirens is said to have taken place on this spot. The Muses excelled in creating beautiful music; indeed so splendid was their music that they even gave this art form its name! (music < Muse). Still, the audacious Sirens, the sea goddesses that were half woman and half bird, had the nerve to challenge them to a musical contest. Their impudence was due to the fact that they had no rival in their territory, a rocky island somewhere in the Mediterranean sea from where they bewitched those sailing by and led them to wreck their ships on the treacherous rocks of the shore. As you may remember from the Odyssey, the only one who escaped that dreadful fate was Odysseus, because he had the intelligence to put sealing-wax in his companions’ ears and to have them tie him on the ship’s mast... But the Muses were no mere sailors who could not resist their mellifluous songs. And it so happened that the competition took place and the Muses won. After their victory they grabbed the Sirens, pulled out their wings and feathers, and threw them in the sea as a punishment for their rude audacity. In commemoration of the event, the Dorian settlers decided to call their town Aptera. The striking landscape always delights the heart, and delight gives the artist wings. On the other hand, the city’s position on top of the hill greatly contributed to a feeling of security. These facts allowed the people to... take off and reach the height of achievement. Their craftsmanship was famous not only in Crete but also on the Greek mainland and even as far as Southern Italy. Their workshops turned out the most beautiful masterpieces. They had their own fleet of ships and two handy ports at the Souda bay, and they built up a lively trade. The city prospered during a long period of time, during which no less than seventy-two different coins were minted! Since Pashley’s days, only a few excavations have taken place in the large area where once the ancient city stood. Those few that took place brought to light some significant findings, many of which you can admire at the Hania Archaeological Museum. Most of the treasures, though, remain buried under the ground awaiting the government subsidy that will allow the archaeologists to find them. A notable part of the city wall, which once had a perimeter of approximately four kilometres, still stands in good condition, as do two large vaulted cisterns dating from the Roman period, the ruins of a theatre, the foundations of many houses and temples, some vaulted tombs, and the mosaic floors of some old Christian basilicas from the last period of the city’s existence. At the centre of the archaeological site there is a guarded area surrounded by a fence, where you can see the foundations of a small temple dating from the classical period (5th century BC) and an arched Roman building that probably housed the parliament. But the greatest part of the town, once full of ancient houses and streets, is now below the olive groves and barren fields. Syros. This is the island where Greek tradition and western influence come to a harmonious marriage. Ermoúpoli(meaning “the city of Hermes”) is the island’s capital town and has been the first important trade and industrial centre of the country in the 19th century. Evidence of this glorious past can be seen on public buildings (the City Hall, the Customs Office, “Apollo” theatre), on the neoclassical houses and at the beautiful squares. Due to its economic activity, Ermoúpoli has been called “Manchester of Greece” and the history of its years of blossom is exhibited in the Industrial Museum.